This is horrible and I slightly feel bad for showing/discussing this but I laughed too much not to show it. There are many questionable shoes on the market these days and everyone has their own taste and opinion on shoes. Lord knows shoes that you might find amazing and wear I might not be attracted to or want near my feet. 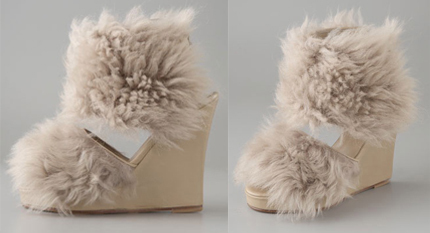 However, this was not the thought when I saw these Opening Ceremony Fur Wedge Sandals on Shopbop.com today. These are plain out hideous but yet highly amusing at the same time. In my whole life I have never laughed at a pair of shoes until I saw the black version! I think I had a pet when I was little that looked like this! They look like they need a hair cut or brushed!! Whats worse is that they are sandals! Who would actually wear these? Would you? 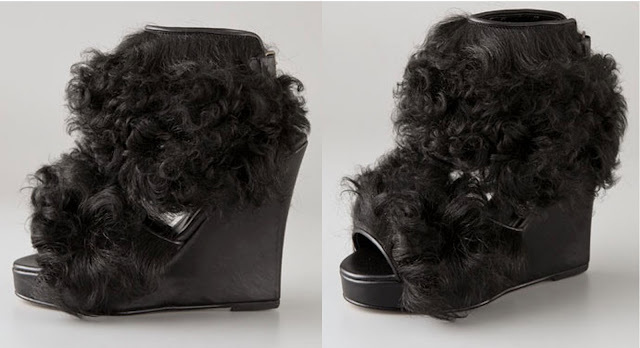 I'm sorry Opening Ceremony your clothes and other shoes are cute but you really failed with this shoe...er....sandal? WTF? Gross! This is an example of designers trying to hard to start a trend. I cant imagine it going anywhere....then again if someone like Kim Kardashian shows up in these, they could spread like wildfire! Wouldnt that be weird?!! !